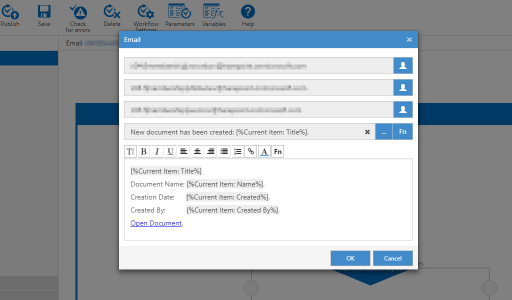 HarePoint Workflow Designer is a free-of-charge workflow designer tool with a handy visual editor for SharePoint Online and SharePoint 2019 / 2016 / 2013 On-Premises. It provides you with vast capabilities to develop, edit and manage workflows right in a browser. 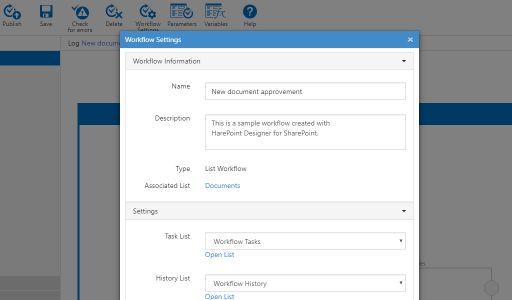 You will no longer need to install SharePoint Designer locally to create or adjust your SharePoint workflows, but if that does become necessary, all workflows created with HarePoint Workflow Designer will open easily for editing in SharePoint Designer and vise versa. We provide complete, two-way compatibility with SharePoint Designer! Work in a graphic interface, not in a text editor! 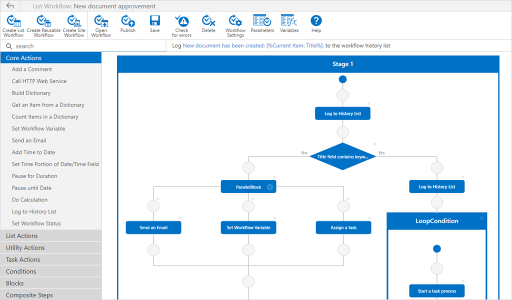 Workflows are represented step-by-step in a flow chart view, allowing you to picture the structure and logic that is executed  this significantly reduces the time needed to develop and fine tune your workflows. HarePoint Workflow Designer makes building workflows simple and comfortable, even for non-developers. With HarePoint Workflow Designer, you do not need any additional development software on your computer, you can create and edit your workflows inside a browser. This feature also ensures platform independence, meaning that you will not need to account for any effects of your operating system when developing workflows. 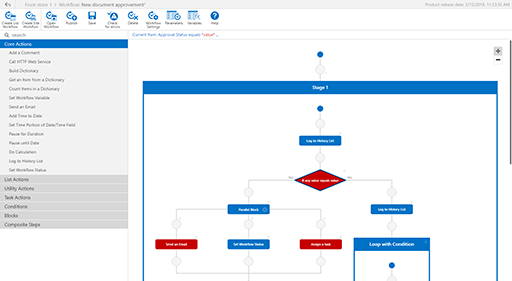 HarePoint Workflow Designer supports all standard actions in SP and can easily be expanded using the stunningly large set of additional activities available from HarePoint. These extensions let you create workflows of any level of complexity to address any business task without losing time developing activities on your own or on future support of them. Possibly the most important thing about HarePoint Workflow Designer is that the product is absolutely free for both commercial and non-commercial use. Simply install the app and you will be creating workflows using this friendly and convenient tool without any charge whatsoever, now or ever. The convenient visual editor lets you represent a workflow rapidly and visually as a flowchart. This method of representation provides a general overview of the connections among workflow activities and provides a clear picture of the workflow state not only for experienced users but also for beginners. The editor can be run right in a browser, you don't need to deploy any apps on your workstation. The thoughtfully designed user interface allows speedy and error-free configuration of the given activity's parameters. 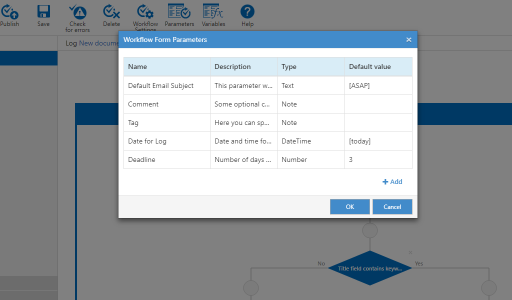 The workflow settings dialog is created in such a way that users experienced with SharePoint Designer will find configuration of workflow parameters very intuitive. Newcomers to creating workflows will also find the tool to be straightforward. The dialogs for operation with parameters and variables have a 'classic' view similar to SharePoint Designer and provide features for convenient, visually-oriented configuration. The built-in workflow validation feature allows to detect and repair apparent errors fast and efficiently by showing such problems visually. 300+ activities for workflow authoring allow you to automate any business process without coding. Freeware tool that launches workflows manually and/or according to a schedule with specified parameters. You are welcome to share your experience with HarePoint Workflow Designer for SharePoint among us and other HarePoint users.